(Nanowerk Spotlight) Traffic planners are sometimes faced with a rather counter-intuitive observation – adding a new road to a congested road network can lead to a deterioration of the overall traffic situation, i.e. longer trip times for individual road users. Or, in reverse, blocking certain streets in a complex road network can counter-intuitively reduce congestion. This has become known as the Braess paradox, named after the German mathematician Dieter Braess. Actually, Braess' observation ("On a Paradox of Traffic Planning") is not a real paradox but only a situation which is counter intuitive. As Braess notes, "the mathematical reason is the fact that one has to distinguish between an equilibrium and an optimum. There is a recent interest in the study of this phenomenon since the same may happen in computer networks and not only in traffic networks." And indeed, the Braess paradox later extended to networks in classical physics such as electrical, hydraulic or mechanical networks. Here, again, this paradox lies in the fact that adding extra capacity to a congested network can counter-intuitively degrade the overall performance of the network. Researchers have now applied the concept of the Braess paradox to the quantum world. By combining quantum simulations of a model system and scanning-probe experiments, they have shown that an analogue of the Braess paradox can occur in mesoscopic semiconductor networks, where electron transport is governed by quantum mechanics. The paradox manifests itself by an increase of the conductance network when one arm in the network is partially blocked in a controlled manner. In other words, electrons in such nano-networks can behave like car drivers in congested cities. "The existence of a quantum Braess paradox satisfies one of our initial motivations, which simply was to address this very existence," Serge Huant, Director of Research at Institut Néel (CNRS and Grenoble Univ. ), a laboratory for fundamental research in condensed matter physics in Grenoble, France, tells Nanowerk. "Another motivation was stimulated by our mastering of a scanning-probe technique named scanning-gate microscopy (SGM) that is well suited for imaging and controlling the electron transport through semiconductor nanostructures." Huant and his collaborators from various research institutions in France and Belgium have published their findings in the February 13, 2012 edition of Physical Review Letters ("Transport Inefficiency in Branched-Out Mesoscopic Networks: An Analog of the Braess Paradox"). "SGM was used in our work to tune by gate effects the electron transmission though an additional branch in a branched-out coherent network – dimensions in the micron range, i.e. smaller than the phase coherence length – that had the initial form of a rectangular corral connected to source and drain," explains Huant. "This approach has the invaluable advantage of working on a single well-characterized device." 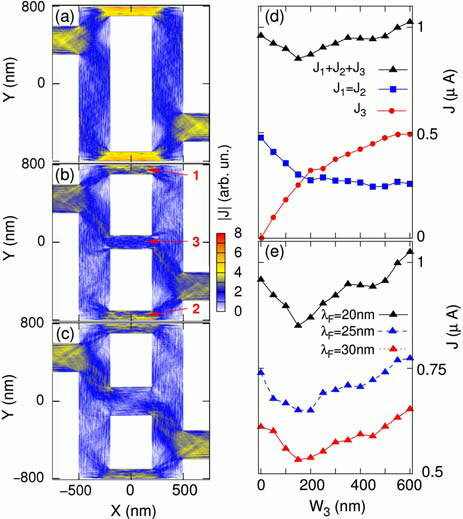 To explore the possibility of a mesoscopic Braess paradox, the team set up a simple two-path network in form of a 1.0 µm x 1.6 µm rectangular corral connected to left (source) and right (drain) Ohmic leads via two planar wires. The upper and lower wires (with a width of 100 nm) are chosen to be narrower than the openings so as to behave as constrictions for propagating electrons. The researchers assumed that a central wire, directly connecting source to drain, and opening an alternative third path to bypass the central 'antidot' should intuitively result in an increased total current. "We show in our paper that it is exactly the opposite behavior that actually takes place" says Huant. The scientists' findings are fundamental in nature but Huant says that he could envision new 'Braess' electronic networks or nano-switches connected to source and drain where the conductance could be tuned or optimized by acting on additional branch(es) by means of spatially selective gates. He notes that the paradoxical effect on the conductance of the mesoscopic network is found to be slightly larger than 10% of the unperturbed conductance, whereas the classical effect predicts effects as large as 33%. "It would be interesting to see if the magnitude of the quantum effect could approach, or even go beyond, the classical optimum," says Huant. "This could be achieved by looking for other network designs or possibly by applying a local external stimulus, such as a magnetic field or a local optical excitation." He adds that the team's first findings raise fundamental issues such as the very microscopic origin of the quantum Braess paradox. "One may also wonder how far the analogy between the classical and quantum Braess paradoxes could be pushed. Finally, game theory is widely invoked to explain the classical Braess paradox. It would be interesting to try reconciling the quantum paradox with game theory."